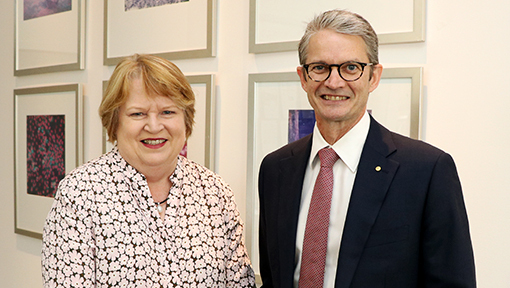 New Burnet Institute Chair Ms Mary Padbury is looking forward to settling into her new role and has pledged to do all she can to provide the Institute with the wherewithal to fulfill its mission to achieve better health for vulnerable communities. A Burnet Director since 2011, Ms Padbury was elected at Tuesday’s board meeting to succeed Mr Rob Milne, who is retiring from the board after almost two decades of service, including the past four years as Chair. “It’s a huge privilege and I’m extremely committed to Burnet and what it stands for,” Ms Padbury said. “This is an institution that reminds of the best in human nature and the role and the privilege we have to help people in the community is amazing. Ms Padbury paid tribute to Mr Milne for his leadership and commitment to rigour and discipline on the board. “Rob may appear to have a gruff exterior, but he’s hiding a tender heart and is hugely committed to the mission of Burnet, and we’ve been fortunate to have him,” she said. A former partner and Global Vice-Chairman of international law firm Ashurst, Ms Padbury is internationally acknowledged as an expert in the field of intellectual property. She is a board member of the Commonwealth Bank of Australia, the Victorian Legal Admissions Committee and Chair of the Trans-Tasman IP Attorneys Board. Ms Padbury is also a member of Chief Executive Women, and a World Intellectual Property Organisation Domain Name Panelist. Introduced to Burnet by former Chair, the late Alastair Lucas AO, Ms Padbury felt immediately compelled to offer support. She appreciated and respected Burnet’s approach to combine medical research with public health action, and the non-judgmental way in which it deals with major illnesses. Ms Padbury is the first woman to hold the position of Burnet Chair, following The Hon Geoffrey Connard AM (1986-1991), Graeme Hannan (1991-2002), Alastair Lucas AO (2002-2014), and Rob Milne (2015-2019).